Some of the hardest working people I know are moms. Somehow they manage to juggle busy careers, a full family life and still have time to pursue hobbies they enjoy. I think back to my own mom and grandmother who always put family first. 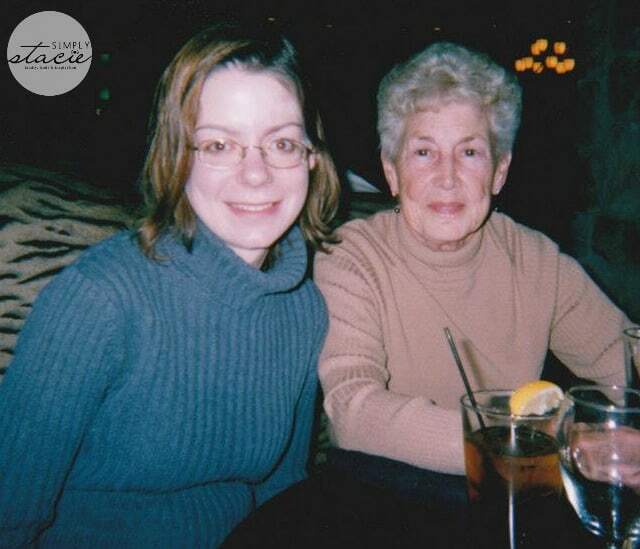 My mom was a stay-at-home mom till I was in my mid-teens. Even when she went back to work full-time, she still managed to always make time for my sisters and I. On the other hand, my grandmother worked until she was 65 and then when she retired, she still worked everyday on the farm. She was full of energy and life. 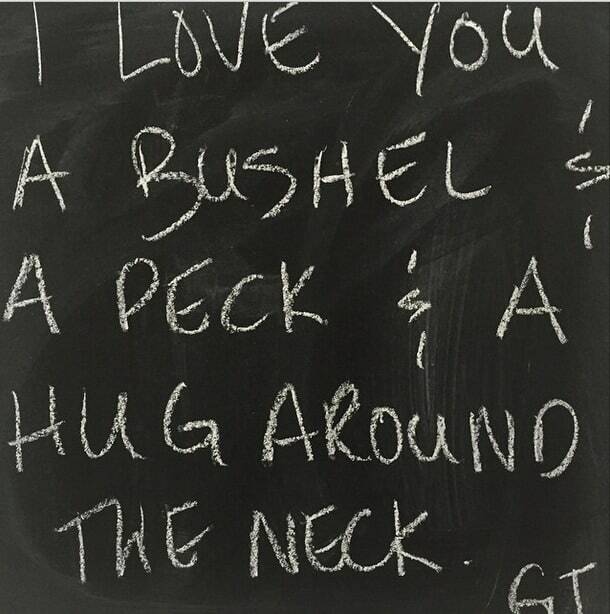 I remember her hugs, songs she would sing and quirky little sayings like this one from an old Doris Day song. I miss her dearly and wish I could tell her that now. Mother’s Day will be here before we know it and I’ve been reflecting on my relationships and what I can do honour them. One way to someone’s heart is through food! I enjoy preparing meals for my family. Even better though, is when someone prepares a special me just for me. It doesn’t happen too often, but when it does, it sure means a lot to me. I’ve partnered up with HP Canada to share some ideas on how to celebrate Mother’s Day with the help of my new HP Spectre x360. This sleek laptop will bend over backwards for you to help simplify your life. Literally. It’s a an ultra-slim, convertible PC with a 360° hinge. It easily transitions to four modes (Tent mode, Laptop mode, Tablet mode and Stand mode) depending on what you need it for. With up to 12.5 hours of battery life, you can take it with you on-the-go too. 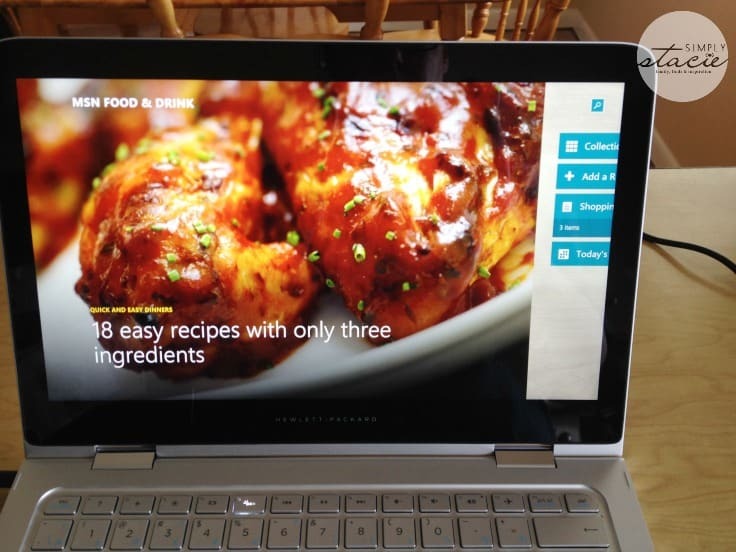 I noticed MSN Food & Drink on the start screen and thought how perfect it would be to use this laptop in the kitchen when I’m cooking. Normally, I’ll print out a recipe and have the paper on the counter for reference. This time, I decided to bring the HP Spectre x360 with me in the kitchen and use it to follow a recipe. MSN Food & Drink has many yummy recipes to choose from. 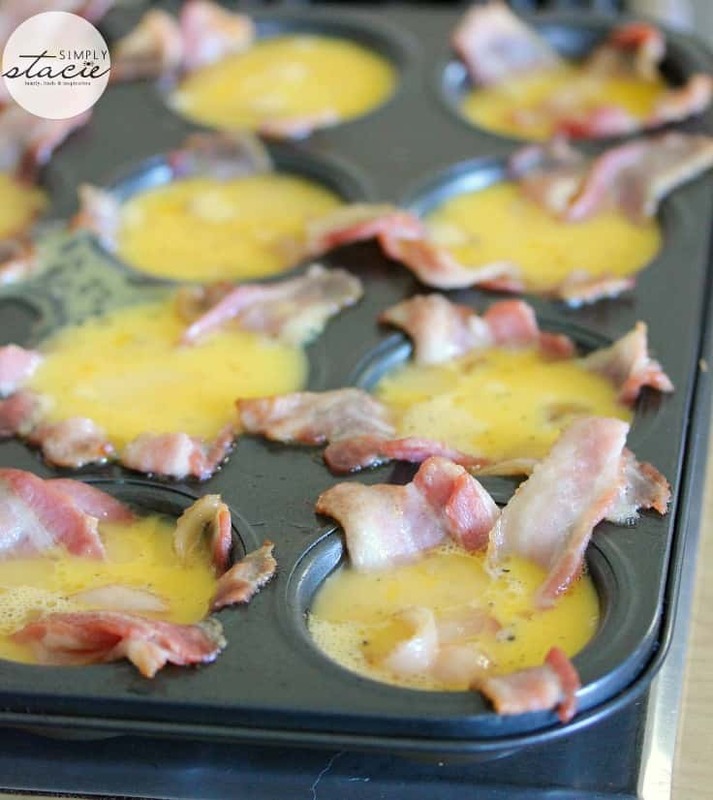 I found a recipe perfect for a Mother’s Day breakfast – Breakfast Cups. With my HP Spectre x360 in Tent mode, I started my prep work and got down to the task at home. The recipe is at your fingertips. I scrolled through to see the directions using the HD touchscreen display with ultra-wide viewing angles. The photos were vivid and sharp….and very appetizing! It was a hard choice to decide what to make! This recipe is super simple with only two ingredients. I liked it because it was a recipe my oldest daughter could make on her own for me for Mother’s Day (hint, hint Olivia). It’s also one the younger kids can help make, with adult supervision, of course. You’ll need a dozen eggs and 12 strips of bacon. I also seasoned with some salt and pepper too. 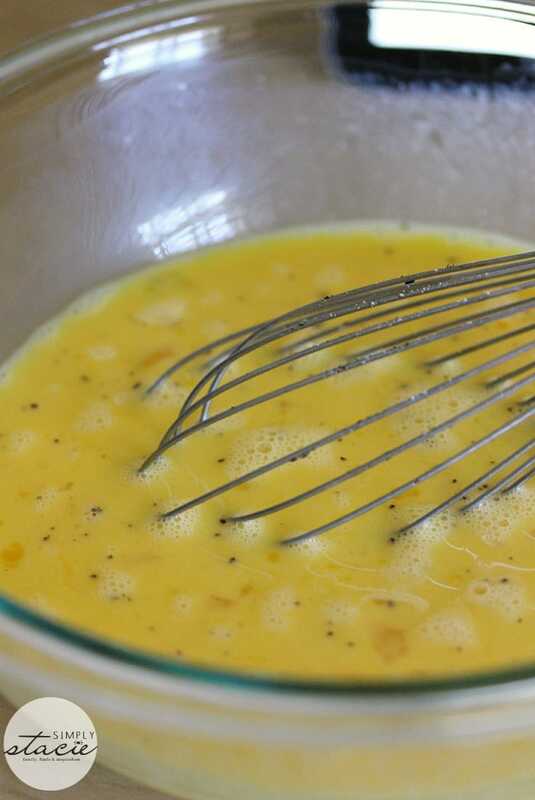 Whisk up your eggs in a large bowl and season to your preference, if desired. 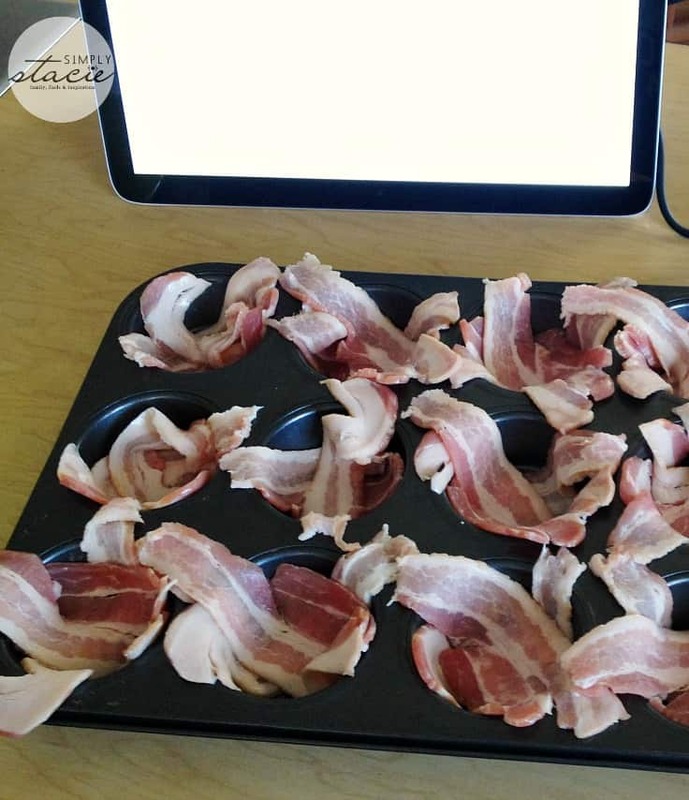 I cut the bacon strips in half so they would fit easier in the muffin tin. The bacon is cooked by itself for 10 minutes at 350°F. 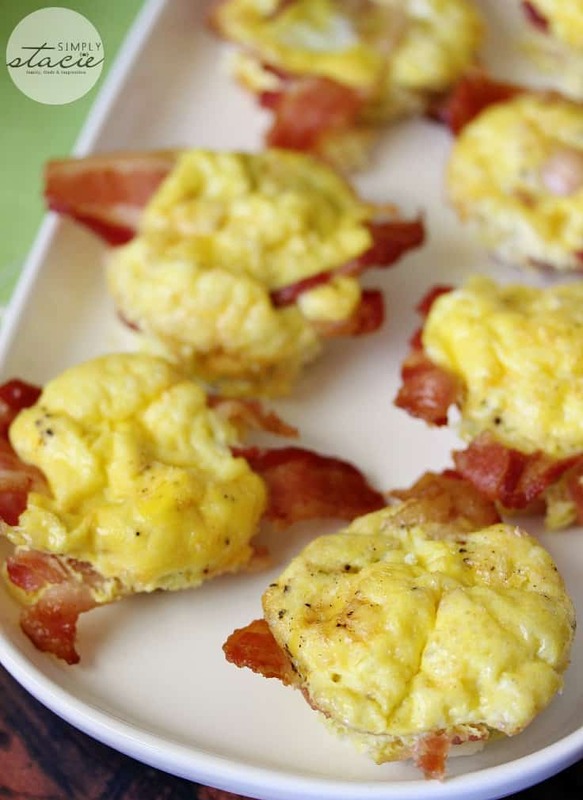 After the bacon has cooked for 10 minutes, pour the eggs into your individual muffin tins and put back in the oven for another 20 minutes. Carefully remove from the muffin tin. It will be HOT! I’d also recommend using cooking spray to grease the pan before you add in your bacon. The eggs stuck a little bit for me. It was still yummy though. Breakfast is served! Serve with a glass of freshly squeezed orange juice or coffee and some toast and hash browns. It’s a wonderful recipe for Mother’s Day because it doesn’t use that many dishes. That means less of a mess to clean up. If mom is watching her carbs like me, then this is a breakfast she will enjoy! I thoroughly enjoyed cooking with my HP Spectre x360 and plan to do it again. It’s easier than printing out a paper (and then losing it) or having to run back to your computer to see what the next step in the recipe is. 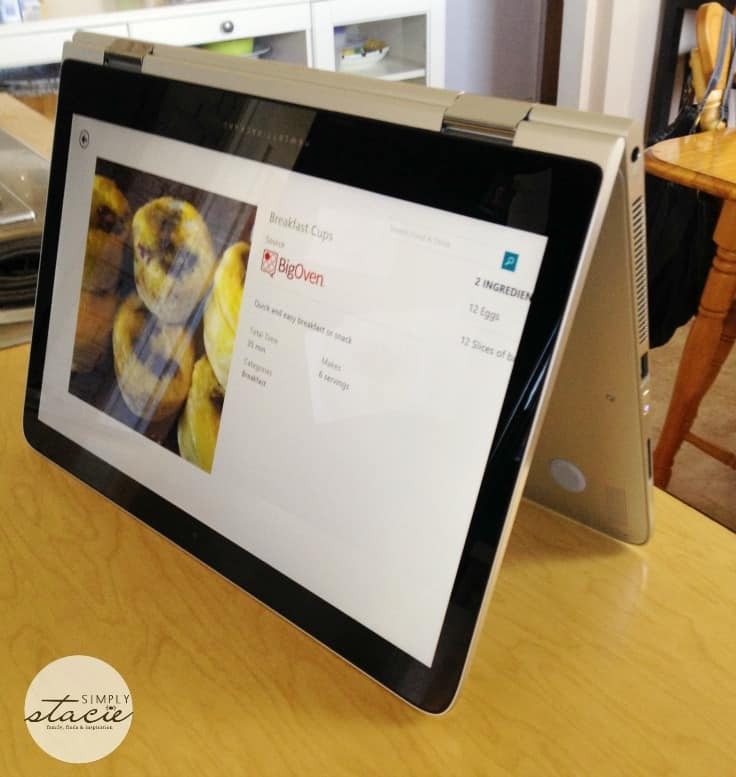 Bring your HP Spectre x360 into the kitchen with you and set it up in Tent mode and you are good to go! That is such a fabulous simple idea, and something I know this mother would love. This looks so tasty. I’ll have to drop a “not-so-subtle” hint to my hubby & son. Maybe they’ll “surprise” me with brunch for Mother’s Day! This would be great to do with my mom. But lost her 8 years ago. These eggs look really good and tasty! but I love the laptop the most very nice and sleek and I love how the lid flips over!! What an interesting presentation to change-up the old bacon and eggs! Love how your laptop turn upside down like that. 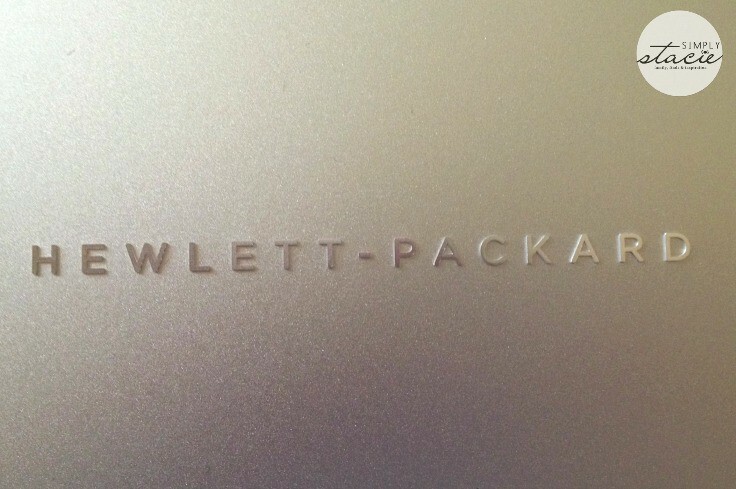 My hubby has a HP Laptop for at least five years now. It is has already outlived any desktop that we owned. The eggs and bacon looks delicious. I always want just something simple for Mother’s Day! Lovely photo! And HP is amazing! 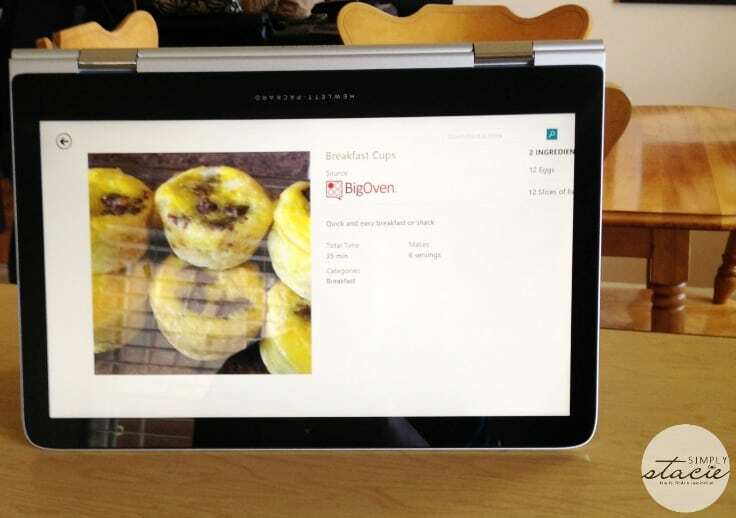 I’d love to have this type of laptop/tablet to use as a cookbook. Thanks for sharing! Yum! What a cute idea, I would love to give this a try. Thank you for sharing this recipe. I love that it’s so easy to make. This looks so delicious. my family and my Mom would love this. I am a big HP fan also. I have always had HP. 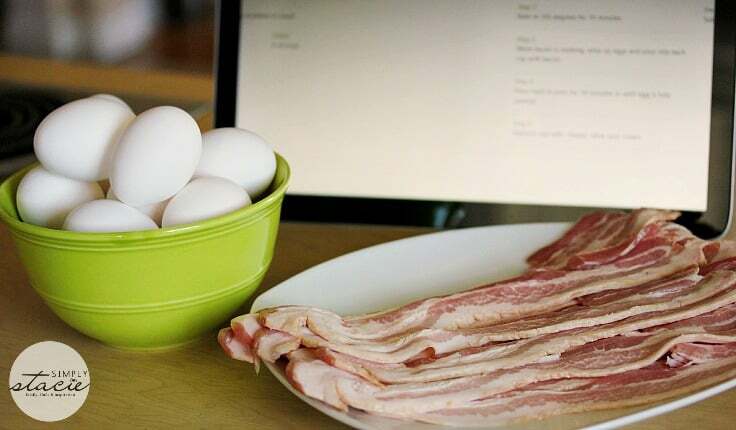 Oh my heck, I love this idea for bacon and eggs, I’m not likely to get this for Mothers day, but I will definitely make it for the family. 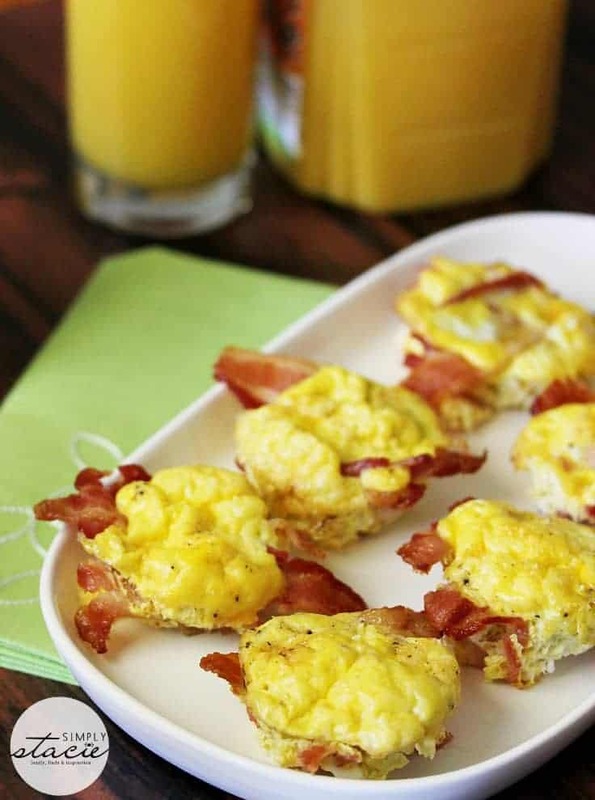 Looks like a great idea for breakfast, thinking it would be good with ham too. oh I want to go to Louisiana for Mother’s Day!!! 🙂 and the breakfast dish looks awesome, too!!! Thanks!! That is such a good idea! Thanks for sharing! These look yummy I hope someone makes them for me. What a great recipe, thanks for sharing 🙂 I love the Tent mode of the laptop, that’s a marvellous invention.